This week, I had the privilege of having a great conversation with one of our ACHS graduates, Lindsay Boyers. Since her graduation from ACHS in 2011, Lindsay has been a trailblazer in the holistic nutrition field. She has established a successful holistic nutrition consulting practice, written multiple articles for the Web, and published two books, The Everything Guide to Gut Health (Adams Media, 2015) and The Everything Guide to the Ketogenic Diet (Adams Media, 2015). 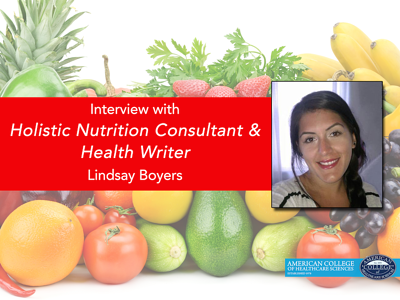 Lindsay has some fantastic advice for students, aspiring writers, and nutrition consultants. If you’re just getting your feet wet in nutrition and holistic health or you’re already an established expert in the field, you’ll want to keep reading. American College of Healthcare Sciences: What’s the story behind your interest in holistic nutrition? Lindsay Boyers: I first entered college as a psychology major at the age of 18. Each day, when I was finished with all my coursework, I found myself spending most of my spare time reading nutrition books for fun. It was fascinating to me. Two years into college, I had a wake-up call and decided it was time to make the switch to nutrition as a major. I completed a traditional nutrition program, one that would set me up to become a registered dietitian, but something just didn’t feel right. It seemed as though a lot of focus was on clinical nutrition—what to do after people got sick—but I wanted to focus on keeping people healthy and empowering people to make the choices that can keep them healthy. That’s when I found holistic nutrition. Once I got my bachelor’s degree, I decided not to pursue the route of becoming a registered dietitian (a designation I was only 900 internship hours away from) and turned my focus to holistic nutrition instead. ACHS: What drew you to ACHS for your education? LB: I’m a researcher. I research EVERYTHING before I make a move. When I decided to pursue a holistic nutrition education, I knew I had to exhaust all options before I made my choice. I found ACHS through the NANP’s website. I wanted a program that could set me up to become board certified in holistic nutrition, in case I decided to do that down the road. I compared all of the available programs side by side and was the most impressed with what ACHS had to offer—the wide variety of certificates and degrees and class topics. The fact that ACHS is accredited by the Distance Education Accrediting Commission (DEAC) was also a big factor for me. I contacted the school prior to making my decision and received a warm (and very quick) response. That solidified my decision. ACHS: Do you have any success tips for current students? LB: I think it’s very important to make a schedule. Distance education is perfect for a busy person, but you have to treat your schoolwork just like you would any other commitment. Block out time each day to read and study. Reach out to your instructors and classmates with questions. Don’t be afraid to get involved. I think the more connected you feel to the school community, the more successful you’ll be. Another tip I like to give is practice what you preach! I’ve noticed that people respond better to those who come from a genuine, empathetic place, so don’t just say, DO! ACHS: Do you have any advice for students interested in a career in holistic nutrition? LB: Now is the time! If you’re even thinking about getting involved in a holistic nutrition career, do it now. I think there’s a wonderful shift happening where people are gravitating more towards a holistic lifestyle than a conventional route. You know that cliché phrase if you have a job you love, you’ll never have to work a day in your life? Well, holistic nutrition is it! It really is so rewarding to help someone who came to you at the end of his/her rope because he/she hadn’t been able to find any answers elsewhere. Also, don’t ever let the cost of tuition stop you. I believe there is nothing more valuable than investing in your education. Knowledge is something that can never be taken away from you. ACHS: As a holistic nutrition consultant, what is the most common imbalance you’ve noticed in clients? LB: I’ve noticed that gut health is a big issue; and your gut ties into EVERYTHING. Sometimes it’s obvious—a client will complain of digestive issues, which easily point to the gut. Other times, it’s more difficult. An imbalanced gut can cause headaches, food sensitivities, and skin issues, like eczema and psoriasis among so many other things. You really have to pay attention to what your client is saying to get to the bottom of the issue. ACHS: Great point. Your writing also focuses a lot on gut health. Can you say a bit more about why a healthy gut is so important? LB: Thousands of years ago, Hippocrates (who is coined the Father of Medicine) said that “all disease begins in the gut,” and I have to agree. Your gut is its own complex ecosystem. It’s home to 100 trillion microorganisms, including about 400 different species of bacteria. Those microorganisms in the gut play crucial roles in digestion, metabolism, and immunity. Without microbes in your gut, your body couldn’t break down the food you eat or use the energy it creates for body processes and your immune system (75 percent of which lies in your gut) wouldn’t function properly. The gut is also often called “the second brain” because it plays a major role in your mental state. Although digestive symptoms like bloating, gas, constipation, heartburn, diarrhea, and irritable bowel syndrome are common indicators of a damaged gut, they are only the tip of the iceberg. A damaged gut is also connected to autoimmune diseases like thyroid disease, diabetes, multiple sclerosis, and lupus and things like hives, skin rashes, eczema, acne, bad breath, joint pain, and muscle pain. The list really goes on and on. Because it plays a role in so many areas of your body, a healthy gut is absolutely critical to your well-being. Processed foods, refined sugar, chronic stress, over-use of medications, and a fast-paced lifestyle have become the norm, and these are all things that are toxic to your gut health. Regular exposure to chemicals and toxins kills off the good bacteria in your gut and gives the bad bacteria a chance to thrive. When bad bacteria take over, your gut goes into a state of dysbiosis—or bacterial imbalance. Although you may not feel anything at first, eventually this dysbiosis can lead to the health problems I mentioned earlier. ACHS: In The Everything Guide to Gut Health, you discuss incorporating other holistic health modalities, such as yoga, to promote digestive health. What other modalities—besides healthy nutrition—do you recommend or practice? LB: I highly recommend yoga and meditation as well as regular massages and chiropractic care. I’m a firm believer that a high-stress level can completely negate all of the healthy nutrition changes you make and wreak havoc on your gut. Although it’s impossible to avoid stress, especially in today’s world, you can do things to manage it. I also recommend taking a look at the other things in your life that may be causing a toxic burden. Nutrition is a HUGE factor in your health, but the buck doesn’t stop there. Chemicals in skincare products and household cleaning products can also affect your digestive health—and your health, in general. I think this is something that a lot of people tend to overlook, but it’s important, especially if proper nutrition isn’t giving you the results you want. ACHS: Do you have a favorite ingredient to cook with? ACHS: What sparked your desire to share your knowledge through books? LB: I’ve always loved to read and write. When I was in second grade, my class went on a field trip to a water park. I brought an entire backpack full of books and spent the entire day reading them in a lounge chair. I think that spark has always been there, but my motivation comes from wanting to reach as many people as I can with my message—which is that you CAN take control of your health. ACHS: Writing two books is quite an accomplishment! Can you talk a bit about your writing and researching processes? LB: Thank you! The Internet is an exceptional resource, but when I’m writing, I like to go “old school.” I take out a notebook and brainstorm ideas. I write them down in an outline form and then hit my local library for relevant books. I block out time during the day to sit down and just get lost in books. When I write, I pretend that I’m speaking to a friend. I like to try to keep it conversational, instead of technical, while still getting the information across. ACHS: What is your advice for those who want to get healthy and start eating right, but just can’t find the motivation to put their health into action? LB: First off, you’re not alone. This is probably one of the most common roadblocks I run into—people who want to make a change, but just don’t have the time or energy. I think the most important thing to remember is that your health should ALWAYS be number one; and if you put a little effort into getting healthy, your body will thank you by running like a well-oiled machine, giving you more time and energy to do the things you need to do. Second, don’t think that you have to change your life overnight. Eventually, even baby steps will get you to your destination. Start by making small changes. For example, if you put four packets of sugar in your coffee, start cutting down to two. If you don’t exercise at all, start by doing 10 minutes a day. I always stress to my clients that I don’t expect them to go from eating fast food three times a day to a completely organic diet in a week. Lasting changes take time, and that’s okay. ACHS: What are your plans for the future? Any upcoming books we should look out for? LB: I hope so! I don’t have any immediate book plans, but I do have some ideas that I would like to turn into a reality. As of right now, I’m just working on building my nutrition consulting practice and learning as much as I can along the way. I’m also a licensed aesthetician so I recently signed up as a consultant for Ava Anderson Non Toxic, a company that makes completely safe and non-toxic household cleaning products and skincare products for adults and babies. My goal is really to help people reach their full health potential by helping them understand that there are a lot of different factors to consider. ACHS: If you were stuck on an island and could only grow one crop to eat, what would it be? Renee is a creative writer and the content development manager for ACHS. She holds an MFA from Florida Atlantic University. She loves finding new ways to communicate and tell stories, and she enjoys writing about holistic methods that can bring others wholeness and total healing. Her perfect day would include her loved-ones around a campfire on the beach, a warm mug of tea, and her journal.